Remembering the late Soviet leader. Everett Collection Premier Vladimir Lenin, addressing crowd on Sverdlov Square, Moscow, Russian, May 5, 1920. Maxim Gorki remembers the late Soviet leader. To me Lenin is not only the wonderfully complete incarnation of a will set upon a goal which no man before had dared to set himself; he is one of those great figures, one of those tremendous, half-legendary men who crop up from time to time in Russian history, always unexpectedly, like Peter the Great, Michael Lomonosoff, Leo Tolstoi, and others. I believe that such men are possible only in Russia–the country whose history and manner of living always remind me of Sodom and Gomorrah. To me Lenin is the hero of a legend, a man who had torn the burning heart out of his breast in order to light up for mankind the path which shall lead it out of the shameful chaos of the present, out of the rotting bog of stupid current politics. . . .
His hero-character has almost no outward adornment. His heroism is of a type not rare in Russia–the modest, ascetic martyrdom of an honorable, intellectual revolutionary who honestly believes in the possibility of justice on earth; the heroism of a man who has renounced all the pleasures of life to do hard work for the happiness of mankind. The task of an honorable leader of his people is superhumanly difficult. One cannot conceive a leader who is not to some degree a tyrant. Probably more men were killed under Lenin than under Wat Tyler, Thomas Munzer, or Garibaldi. 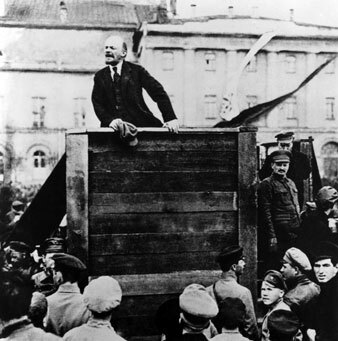 But the opposition to the revolution at whose head Lenin stood was also broader and mightier. One must recall too that with the onward march of “civilization” men’s lives have become cheaper; the perfection of the technique of destroying men and the taste for that process in modern Europe prove it beyond a doubt . . . . Ask your conscience: Is the chatter of those “moralists” who talk of the bloodthirstiness of the Russian revolutionaries, after they themselves through four long years of the World War had not only had no sympathy for millions of men who were driven to the shambles, but had actually preached war “to the bitter end”–say, is their chatter fitting here? Is it not rather out of place? All the civilized nations are beaten, exhausted; they are slipping toward savagery, and only human stupidity has conquered-its harsh bonds are choking us still. He himself was very modest in his demands, took neither wine nor tobacco, and was burdened with heavy work from morning till evening; he did not know how to look out for himself, although he carefully watched the life of his comrades. His interest for them was a tender care, such as is usual only in women. Every free moment he gave to others, without seeking rest for himself. Smiling, wrinkling his eyes, he stretched out in his armchair and added in a softer voice: “What a colossus, wasn’t he? What an old giant! Yes, friend, there’s an artist for you! And do you know what is wonderful about him? His peasant voice, his peasant mind–there was a real peasant in him. Until that count began writing there was no real peasant in literature–not a one.” Then be looked at me with his little Asiatic eyes and asked: “Who is there in Europe to compare with him?” and himself answered “None!” And, like a cat in the sun, he rubbed his hands and laughed contentedly. I often noticed in him that pride in Russia, in the Russians, in Russian art. Often this trait seemed strange and even naive, but later I recognized in it the echo of a deep, joyful love of his people. . . . In Russia, a country where the necessity of suffering is preached as a universal prescription for the salvation of the soul, I know no one who so profoundly hated and despised the unhappiness, the misery, and suffering of mankind. This feeling, this hate of the dramas and tragedies of life raises Vladimir Lenin particularly high in my eyes–this man of iron in a land where the most ingenious gospels have been written to exalt and honor suffering, where the youth begin to live their lives according to books which do nothing but describe the monotonous details of daily life. Russian literature is the most pessimistic literature of Europe; all our books are written upon the same subject–how we suffer in youth and in maturity from stupidity, from the oppression of absolutism, from women, from our family love, from the inadequate arrangement of the world; in old age from recognition of our mistakes, from loss of teeth and bad digestion; finally, from the necessity of death. . . .
Perhaps Lenin conceived the drama of existence too simply and thought it easy to combat, as easy as it would be to do away with the dirt and disorder of Russian life. Well, be it so! I rate high in him just that feeling of irreconcilable and unquenchable hostility to human misery, his firm belief that misery is not the necessary basis of existence but rather something detestable which man must and can repel. I would call this characteristic his optimistic joy in battle, and it was no true Russian character. . . . I marveled at his superhuman capacity for work. His fiery zeal was native to him; it was not the selfish pride of a gambler, but an extraordinary freshness of spirit, which only a man could have who believed absolutely in his task, who felt himself profoundly and closely a part of the world, and who knew his role in the chaos of the world from the ground up–the role of an enemy of that chaos. He loved a joke, and laughed with his whole body, as if he dived into a laugh, often laughing until he cried. He could give the most various colors to his short, characteristic “Hm, hm”–from biting irony to cautious doubt, and often there rang in it such a humor as is possible only in a keen man who knows the devilish absurdity of life. Of a solid, thick-set body, with the skull of a Socrates and the all-seeing eyes of a very wise man, he often took on a strange and rather ludicrous posture: bending his head back and toward his shoulder, he would tuck his fingers in the sleeve-holes of his vest. There was something rather lovable and comic in that pose, something that reminded one of a victorious rooster, and at such moments he beamed joy. His movements were light and easy, and his rare but strong gestures fitted perfectly with his manner of speaking, sparing of words, but rich in thought. In his Mongolian face there burned and played the sharp eyes of a hunter who tirelessly chases the lies and misery of life; they burned now flickeringly, now ironically laughing, now angrily blazing. The gleam of those eyes made his speaking amazingly clear. Often it seemed as if the tireless energy of his spirit hurled sparks from those eyes, as if his words, filled with that energy, burned in the air. His speaking had a positively physical sense of irrefutable truth, and even when I could not accept it I always felt its force. . . .
Men thirst, if they thirst at all, not for a fundamental change in their social habits, but only for more of the same. The cry of man is: “Do not prevent our living as we have always lived.” Vladimir Lenin was a man who as no one before him understood how to keep men from living their usual life. Whether Lenin called forth more love or more hate I do not-know. The hate men bear him stands naked and evident; its tracks are plain as the blue marks of the plague. Yet I fear that the love which many bear him is nothing more than the dim faith of miserable and desperate men in the miraclemaker; that it is a love which expects wonders, but would itself do nothing to realize its own strength in an existence which is almost numbed by miseries caused by the avarice of some and the vast stupidity of others. Vladimir Lenin is dead. The heirs of his mind and of his will still live. In the end, despite everything, whatever a man creates that is true and honorable lives; that conquers without which there would be no men.